The stabbing of a former news editor is a symptom of a broader squeeze on the city’s freedoms. The brutal attack on the former chief editor of a major Hong Kong newspaper has appalled and shocked this city, where violent crimes are rare. 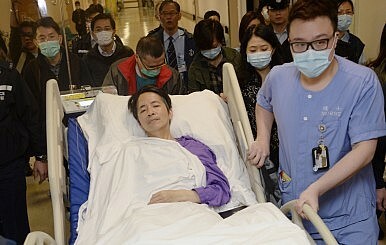 Kevin Lau Chun-to, a veteran journalist who had just stepped down as the chief editor of the respected Ming Pao Daily, was stabbed six times in a hit-and-run attack last week. Fortunately, following surgery, Lau’s condition has now stabilized. But for Hong Kong, the wounds will be more lasting. Not only did the attack leave a permanent scar on the freedom of the local press, it may have also laid bare the erosion of Hong Kong’s self-autonomy under the phony One Country Two Systems. The cause of the attack is still unknown. Sadly, as the hit men are believed to have fled to Mainland China, the hunt for suspects has become more challenging. It is likely, therefore, that the brutal assault might well remain unsolved – a grisly addition to the city’s poor record on cracking media-related attacks. Over the past few years, there have been seven other reported incidents in which media professionals and outlets critical of the Hong Kong government and the Beijing authorities were threatened or attacked; none have been solved by the otherwise effective police. Lau was at the eye of a storm just two months ago when he was removed from chief-editorship after serving for only two years (his predecessor had held the post for 15 years) and transferred to a non-editorial position. The plan is to replace him with a Malaysian editor who seems to have little experience in Hong Kong news reporting. Pundits have linked the unusual personnel shift to Ming Pao’s owner, Zhang Xiaoqing, a Malaysian billionaire with business ties in China, who may been seeking to tone down the critical character of the newspaper. Although many Ming Pao journalists resisted the move, the soft-spoken Lau accepted it without open opposition. That is why people were shocked not just by the attack itself, but also by the fact that the target was Lau, seen among journalists as a moderate personality. Even though Ming Pao largely retained its critical voice under his leadership, Lau, who is well connected with government officials and politicians from across the spectrum, seems unlikely to have been seen as a “problem child” in the eyes of the authorities. What is most troubling, therefore, is that even such a moderate liberal style can attract such brutal violence; a “lesson” that might well have long-term repercussions for critical journalism. The implications are important. The generally moderate Ming Pao has been renowned for its investigative journalism on socio-political affairs in both Hong Kong and China. Among its outstanding coverage under Lau, the paper worked with the International Consortium of Investigative Journalists (ICIJ) as the only Chinese media company on a project about offshore money leaks, which led to a story in mid-January about the offshore holdings of former Chinese Premier Wen Jiabao’s family members. Similar reports that exposed the enormous wealth of high-ranking Chinese officials that have appeared in foreign media, namely The New York Times and Bloomberg News, have also resulted in reprisals such as visa delays from Beijing. Although there is no evidence to link that particular Ming Pao story to the assault, the ICIJ report has certainly attracted the most speculation. More generally, Hong Kong has experienced rising media censorship over the past decade. Citizens have long noted subtle changes that appear to threaten the city’s long-cherished press freedom. Enterprises with large China operations or funding are refraining from advertising in critical media outlets. Politically sensitive news, like the commemoration of June Fourth, or news unfriendly to the authorities, are at times self-censored by paranoid media groups, and fewer items can be seen on the city’s two free TV news channels. A local businessman who started a new TV station, meanwhile, was denied a license, with no persuasive explanation from a government that prides itself on its support for entrepreneurialism. Just one month ago, an outspoken radio host, known for her caustic criticism of domestic and mainland affairs, was sacked without explanation. These events are reflected in the Press Freedom Index released by Reporters Without Borders: Hong Kong’s ranking has tumbled from 18 in 2002 to 61 today. Admittedly, any accusation of an invisible hand interfering with the media runs the risk of becoming conspiracy theory. After all, “evidence” is hard to find, especially when it comes to self-censorship and an invisible Big Brother. But there is at least one common denominator in all of these mundane events. They are all, one way or another, connected with criticisms of Mainland politics or with keeping public opinion within politically correct limits so that it does not offend Beijing. It is worth recalling that more than half of Hong Kong’s media owners have been appointed to the two national bodies – the National People’s Congress (NPC) and the Chinese People’s Political Consultative Conference (CPPCC) – a typical united-front tactic used to co-opt elites and extend the reach of the Party. Many also have extensive business interests in China. Zhang, the owner of Ming Pao, for instance, is investing heavily in his conglomerate’s Chinese operation. An image 2011 shows him at one of Chongqing’s Red Song rallies, standing an arms length from the now fallen Bo Xilai. Sadly, the feeble state of media freedom is only part of a grim picture. Apart from media censorship, the China factor is more tangibly observed in a national blueprint to foster Mainland-Hong Kong economic integration. For example, the Individual Visits Scheme, introduced since 2003, has made it easier for Mainland visitors to travel to Hong Kong. This gave an immediate boost to the faltering economy, although the influx of tourists gradually became a source of local discontent. The Scheme, however, is only one part of the Closer Economic Partnership Agreement (CEPA), a larger plan introduced in the same year. The plan, presented by Beijing as a “generous gift” to Hong Kong, removed trade and investment barriers across the border, allowing Hong Kong firms to do business in China with much fewer restrictions. Closer business cooperation is quickly followed by faster geographical integration. In 2009, the governments of Hong Kong, Macau, and Guangdong jointly promulgated a plan to integrate the Pearl River Delta into the so-called “one-hour living circle,” in which Hong Kong will become an integral provider of financial, professional and retail services. Profitable to the economy as they all might seem, none of them have undergone rigorous public consultation in Hong Kong. From the perspective of the central government, however, economic integration is a highly effective strategy to make Hong Kong dependent on China’s rising consumption power. Dependence, needless to say, spawns compliance. Symptoms of contracting self-autonomy surfaced after 2003. For instance, the Marine Department stopped Hong Kong boats from sailing to the Diaoyu/Senkaku islands, with all sorts of unsound reasons. In addition, the National People’s Congress repeatedly exercised its interpretative power over the Basic Law, Hong Kong’s constitutional document. Beijing’s official line is that “all powers exercised [by Hong Kong] are derived by way of authorization by the central authorities,” meaning that there is no “residual power” on the part of Hong Kong to define or interpret any points not clearly stipulated by the Basic Law. A more recent example is the 2013 court ruling on immigrants’ eligibility for social welfare. The Final Court of Appeal overturned the government’s administrative move in 2004 to require immigrants to remain in Hong Kong for seven consecutive years (as opposed to one year previously) before they could apply for social benefits. The ruling restored the residency term back to one year, which means that it will become much easier for immigrants to receive welfare. This created unease among the middle class, who fears that the relaxed policy will result in heavier welfare expenditure. How this will affect the city’s sound fiscal reserves is still a subject of debate, but the ruling highlighted a fundamental issue: the Hong Kong government does not have the right to screen and assess the 150 Mainland immigrants who come to the city each day under the One-Way Permit Scheme. The Chinese authorities have firmly retained the assessment rights as an uncontested symbol of sovereignty. The resulting paradox is that Hong Kong residents, living in a half-baked democracy, will have to provide welfare payments to people to whom does not have the power to deny entry. This powerlessness to control immigration not only deprives Hong Kong of its ability to formulate a long-term population policy, which is clearly within the boundary of self-autonomy, but is also becoming a source of tension between Hong Kong people and Mainland Chinese. All of these are signs that “One Country Two Systems,” despite Beijing’s constant reassurances, has deviated from its original intention. Worse, the entire policy shows indications of being a false promise designed to bring Hong Kong into political compliance. A city that prides itself on freedom, the rule of law and low corruption, Hong Kong now faces a difficult road ahead, for what is at stake now is more than just treasured press freedom, but something more intimate: personal safety, the right to tell the truth, and the conviction of freedom – all core values that once allowed the Pearl of the Orient to shine. Samson Yuen is a PhD candidate in Politics at Oxford University who specializes in Chinese politics. He is also a research assistant at the French Centre for Research on Contemporary China, and a regular contributor to Hong Kong newspapers. Kitty Ho is a Hong Kong-based social commentator and a former journalist. She is now a teaching assistant at the Journalism and Media Studies Centre of the University of Hong Kong. Italian mafia families have begun using Hong Kong as a base for financial crimes.